I have Astigma….whaaat? Our patients are often baffled when they hear this. 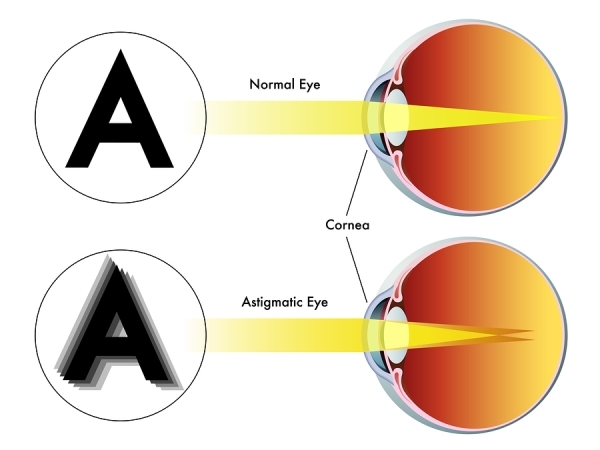 It is called Astigmatism and it is not a disease or contagious. It is just a very common condition of the eye that causes blurred or distorted vision and has nothing to do with any other visual deficiency like being short sighted or farsighted. Most people have it to some degree and often don’t even know that they do. Astigmatism is caused by an eye that is not completely round like a sphere but shaped more like a rugby ball. So now when light enters the eye it gets refracted more in one direction than the other allowing only parts of what you are looking at to be clear and other parts to be blurry. Objects appear wavy and blurry. Symptoms of astigmatism, apart from blurry vision could be eye strain and headaches especially after prolonged reading and visual tasks. The good news is that astigmatism can easily be corrected with properly prescribed glasses or contact lenses. Astigmatism often occurs early in life so it is important to have those little ones tested early – also to avoid vision problems in school. A simple comprehensive eye test can determine this condition – Another reason to have your eyes tested regularly.